Make ’em Ups’ co-owner and founder Owen Stanford wants to ensure that anyone can engage with his improv company. Make ’em Ups performs improv shows, as well as offers classes, which welcome players of all levels. “I just want it to be the most inclusive here [in Nova Scotia], make it accessible for everyone,” says Stanford, who manages the group’s artistic direction. All the classes are based on games. The eight week beginner-level class starts with games to get participants comfortable around one another, and in subsequent weeks focuses on impulsive thinking, basic staging techniques, character development, and story and narrative. “It’s just about being comfortable and teaching people to make different choices,” Stanford said. Managing director Brian MacQuarrie proposed incorporating a mental health aspect into the classes. The classes promote confidence building, and help members overcome fears. “If it helps someone who’s not maybe happy, then all the better,” Stanford said. Throughout high school, Stanford read, saw and learned as much as he could about improv. He has been involved with the Canadian Improv Games (CIG), an improv competition for high school students, since being in high school himself. He eventually became a trainer, and is now regional director for the Nova Scotia tournament. “Hearing that I’ve changed a high school student’s life just from playing games with them, or encouraging them to make a silly face, [is something] you can’t buy,” Stanford said. 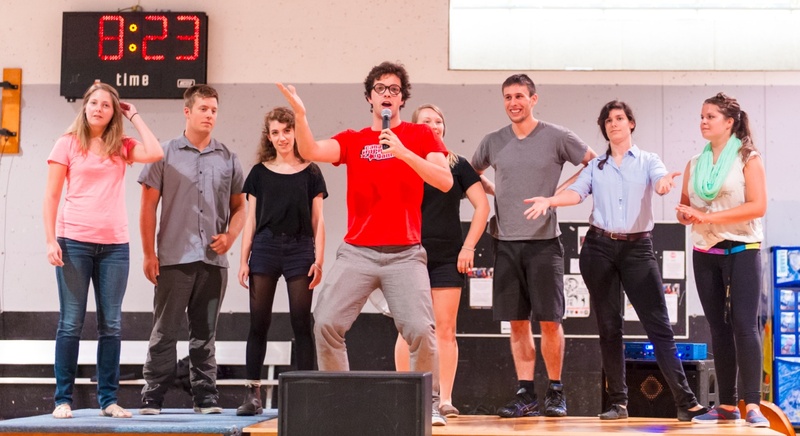 Stanford eventually found himself working with a Toronto improv group, Bad Dog Theatre. Make ’em Ups’ inclusive mission is inspired by Bad Dog’s inclusive environment, where artistic director Julie Dumais Osborne made time for everyone involved and ensured they received stage time. Make ’em Ups also focuses on displaying the different sides of improv. Produced with Oasis Pub, the company hosts a competition night every second and fourth Friday, appropriate for the sports bar environment. Their short-form improv nights every Sunday at the Company House allow for lots of audience involvement. The Make ’em Ups crew also use games to work on their techniques and train in a quick-thinking mindset. For example, when they did a radio play for the Bus Stop Theatre’s Nocturne event, they had to improvise sounds and language appropriate for their location without being too obvious. “It’s working on how to get that impulse out naturally while still remembering to get all your information out,” Stanford said. Upcoming performances in November and December at the Bus Stop Theatre allow each of the 13 members of the Make ’em Ups crew to perform his or her own sketch. Crew members are allowed to work with other improv companies, which Stanford said isn’t always true of other improv groups. He merely requests that the Make ’em Ups crew receive an invite to the show.